Thousands of postal votes are to be sent out again in a key marginal seat less than a week before polling day after an error invalidated some forms. The forms from the Vale of Glamorgan council advised voters they had been granted a "waiver" and did not need to sign the form before returning. In fact, unless the form is signed, then legally the vote will not count. The Vale seat, where Labour had a majority of 1,574 at the 2005 general election, is a Conservative target. The Vale council has now been forced to reissue all its postal votes. A Vale of Glamorgan council spokesperson said: "Within the postal voting papers, there is a statement relating to a required signature which could lead to some confusion. "Following consultation with the Electoral Commission, the acting returning officer will, as a means of clarification, be reissuing the postal voting statement for completion and return. The spokesperson said anyone with questions should ring the council on 01446 709302, 709303, 709702 or 709747. Voters were originally told they did not need to sign the slip, but have now been informed that in fact they must do so. 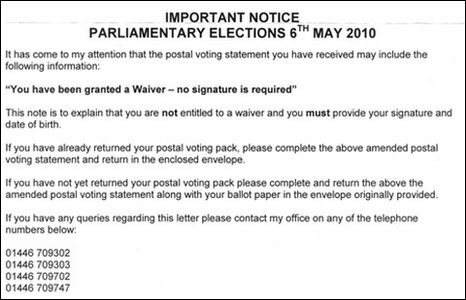 The statement on the postal voting forms reads: "You have been granted a waiver - no signature is required". 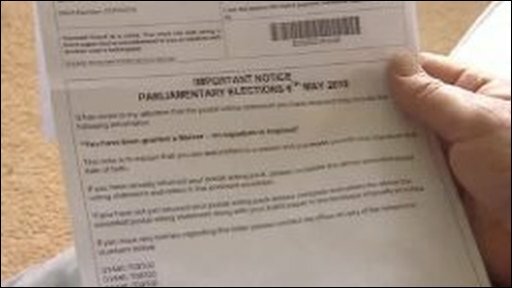 In the letter sent out to voters by the council this week, John Maitland Evans, the acting returning officer, said: "It has come to my attention that the postal voting statement you have received may include the following information 'You have been granted a waiver, no signature is required' ". "This note is to explain that you are not entitled to a waiver and you must provide your signature and date of birth." The council has been asked how many votes have already been returned before the error came to light. The elections watchdog the Electoral Commission confirmed it had given advice to the council but said it would not comment further on the situation. A Welsh Conservative Party spokesman said: "We are disappointed at this news. It is important everyone entitled to vote is able to do so." A spokesperson for Plaid Cymru in the Vale of Glamorgan said: "It's good to see that this confusion has been spotted by the council, and we're now depending on them to ensure that nobody's vote is lost. "Now, more than ever, it is extremely important that people feel that they are the focus of our democratic process. "The pressure will certainly be on to get this all sorted out by polling day but that is simply what has to happen." A Welsh Labour spokesperson said: "We are extremely concerned about what has happened and we are monitoring the situation very closely." Liberal Democrats said they did know that some people had been caught up in the problem. But they said it affected every candidate equally and did not believe more could be done.